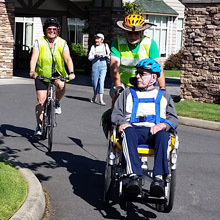 Sequim Wheelers - Serving the elderly and disabled with assisted bike rides! Free Wheelchair-Bike Rides, offering fresh air and sunshine on a bike. 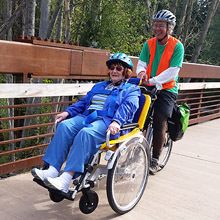 The Sequim Wheelers are looking forward to serving the disabled, young and elderly, with an enjoyable bike ride on the Olympic Discovery Trail! 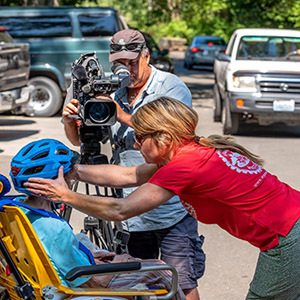 Sequim Wheelers, a nonprofit 501(c)(3), is the fifth program of this kind in the US. We offer FREE wheelchair bike rides on a Duet Wheelchair Bicycle to our elderly and disabled community members, including children. 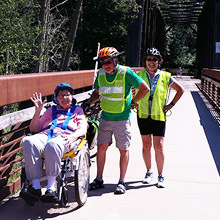 Trained volunteers provide 45 minute to one hour long rides on the Olympic Discovery Trail (ODT) in Sequim. Our goal is to build an inclusive community where everyone can enjoy our amazing ODT without the limitations of physical capabilities. The Audubon Center at Railroad Bridge, a location convenient to the ODT, has graciously agreed to store our bike. Explore our website whether you would like a ride on the Duet Bike, sign-up to be a volunteer, or make a donation to this wonderful free service to our community. Thank you so much! Check out the other programs around the nation. Sequim Wheelers is modeled after similar programs elsewhere. Click below to see the what's in store for Sequim!